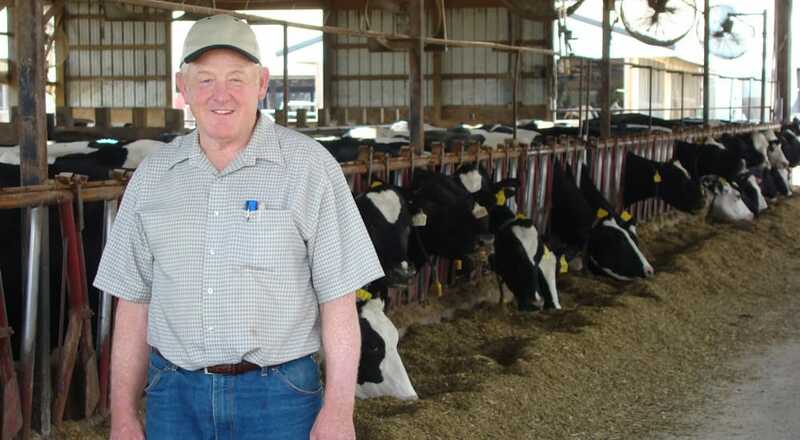 Virgil Gasser works alongside his sons to care for 600 Holstein cows and farm 1,200 acres of crops. Gasser Farms has won several conservation awards, including the OLC Environmental Stewardship Award, which recognizes accomplishments made by farmers to protect Ohio’s land, air and water quality. Virgil: I was born and raised on a dairy farm near here [Creston] and farmed with my father and brothers. In 1974, I started my own dairy operation, and by 1986 purchased the home farm and updated the facilities to accommodate 100 milk cows. I now farm with my sons, Dave, Aaron, Steve and Nate. My sons each grew up here and I couldn’t get rid of them! After each son graduated we added more cows – we are now milking about 600 Holsteins. How do you work with your neighbors? Virgil: We live in the land we farm and we want to provide our family and freinds with the best air, water and land quality possible. The farm has a stream that runs through it and into a neighboring golf course. We have to be cautious with our manure applications, we use soil tests to choose the correct application, and also work with our neighbors to avoid holidays and other events held at the golf course. We also supply our neighbors with the “natural fertilizer” anytime it is requested! Why is it important to be good stewards of the land? Virgil: Land sustains all life and if we’re good to the land, the land gives back to us. We hope anything we do will be an improvement. We’d like to make the land even better than when we started farming here and leave the land for the next generations.